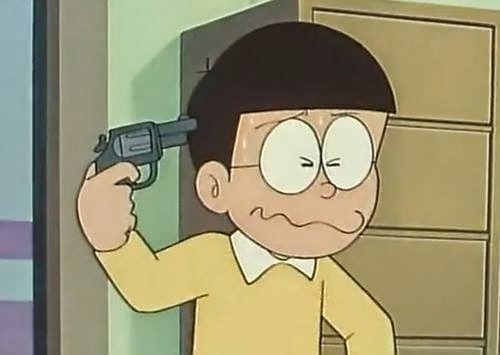 Satirical News: President Nobita Attempts Suicide After Too Many Butthurt Incidents! Please President Nobita do the Philippines a favor and shoot yourself! Just make sure next time that the gun is loaded! President Nobita cannot handle the truth anymore that he is a lousy administrator and Nobitacrats cannot accept it that Nobita is not perfect. The president's career was being criticized severely by political critics who only wanted to improve his performance. The cybercrime law which he implemented because he was ridiculed online only made him an object of bigger ridicule since the jails cannot accommodate all the people guilty of that offense under the libel clause. Worse, the thesis on Nobitacracy's effect on the Philippines was discussed over in ASEAN which caused him to get in trouble in the association itself. In a desperate moment, President Nobita went back to his office in the Malacanang and attempted to kill himself in front of reporters if they did not stop laughing at him. However out of his no brainer moment, the suicide did not push through. The reason why his suicide failed was because he forgot to load the gun with a bullet. The result was that President Nobita after his failed suicide revealed how he was unprepared- even for his supposed death. The failed suicide had become another viral trend on Youtube which caused angry remarks saying that they wish the president himself for once loaded the gun before shooting himself.